Since five hundred million years, something is burrowing on the ocean floor. 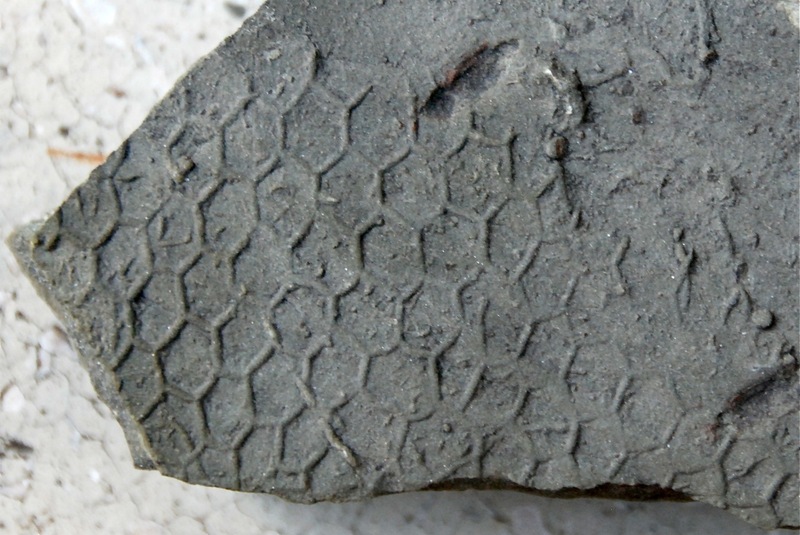 We see its unique traces: two-dimensional grids of burrows, tracing an hexagonal pattern. From each of these burrows small holes reach the surface, letting water in. Paleodictyon exists since the Cambrian. Its fossils -unmistakable grid-like low reliefs on rocks, as wide as one square meter- aren’t particularly exotic: they are a common occurrence in almost all petrified ocean floor sediments. As found out by Andrea Baucon, one of the first to notice them was -perhaps- Leonardo da Vinci. In a page of the Leicester Codex indeed, along with sketches of fossil shells from the Florence hills, he also traced a small beehive-like thing. Unless Leonardo just wanted to tease its future scholars, putting nonsense hexagons within an otherwise ordinary collection of marine fossils, it is plausible that his drawing is, indeed, an image of Paleodictyon. He could also (albeit unlikely) have sneaked it in his paintings. Officially anyway Paleodictyon has been discovered in 1850 by an Italian naturalist, Giuseppe Giovanni Meneghini (often wrongly cited as “Menghini”), while rummaging in the fossil collection of the Florence marquis Carlo Strozzi. Meneghini will describe the hexagonal trace in a geological paper on Tuscany. But that will be it for more than a century. Paleodictyon was just a paleontological curiosity, and little else. In 1976 however something catches the eye of marine geophysicist Peter A. Rona, when looking at a series of pictures taken on the bottom of the Atlantic. Thousands of patches made of tiny, crowded holes in the sand, regularly patterned following an hexagonal grid. What they were, Rona didn’t know: he thought of everything, from a prank of his coworkers to a fingerprint of alien technologies. He asked his fellow oceanographers, who were just as clueless as him. It was instead paleontologist Adolf Seilacher to notice that these mysterious grids were actually specimens of Paleodictyon: not anymore embedded in tough,dry rock, but fresh prints, left in the soft ocean floor under kilometers of dark seawater. Whatever Paleodictyon is, it’s alive: and it is the oldest living fossil known, being basically unchanged since five hundred millions of years. Drawings and pictures of Paleodictyon on the ocean floor, in 1976. Hunt begun. Since 1976, Peter Rona and collegues dive deep to the bottom of oceans. Since 1976 they shoot photographs, take back samples, blow on the floor sand to reveal once more the ancient hexagonal grid of burrows. They even made a documentary on their endless search. Since 1976, they found nothing. In fact, whenver Rona and coworkers analyze the samples, they are just empty. The sand is a desert. Whatever created that little mandala on the Atlantic floor, almost 4000 meters below sea level, everytime they look it is not there anymore. No trace not only of a living, throbbing organism, but not even of cells or DNA. What are then Paleodictyon burrows? Some think it is the trace left from (relatively) huge unicellular creatures, that indeed live on the ocean floor, Xenophyophorans. Among them lurk the largest unicellular beings on the planet, dauntingly fragile immense “amoebas” up to 20 cm wide. Gromia spherica, a single cell organism of three centimeters of diameter, has been pinpointed as the cause of an another enigmatic fossil trace. But Gromia traces are just irregular printings, due to the passive rolling of the cell on the ocean sediment. The regular, infallibly geometrical galleries of Paleodictyon seem to require something more: a behaviour, and/or a complex body plan. Seilacher thought that Paleodictyon is actually the most ancient farming on Earth. Galleries would have been a protected environment for bacteria or fungi, from which then the organism could feed. Or the galleries could be a trap, where the plancton, brought by currents, would enter from the openings and become stuck within the burrows network, allowing it to be eaten. Some tests show that the three dimensional structure of Paleodictyon, the center slightly convex with respect to the edges, would allow such a circulation. Another paleontologist, Mark McMenamin, has hypothesized that Paleodictyon is a nest, and that galleries are left from larvae hatching from eggs. Still others believe it is actually the body print of a bizarre sponge, and that the galleries aren’t but the negative of the then-disintegrated skeleton. Some sponges actually show a reticular, hexagonal scaffold vaguely similar to the burrows of Paleodictyon. All these theories have one thing in common: no evidence. No peculiar concentration of plancton is found in the galleries. No egg or larva has ever been found in the burrows. No sponge trace has ever been found within or close to a Paleodictyon. The silent hexagonal grids of Paleodictyon survive, forgotten and unintellegible, ignored by the world at large but for a handful of paleontologists, marine biologists and the inspiraction of some contemporary art. Paleodictyon and us share the Earth, yet we never touched. I want to know what it is: however a part of me hopes, in a pure, immature romantic perversion, for this never to happen. That part of me hopes that, after our species disappears, something will keep on sculpting hexagons in the sand, its nature never having been known. Next Post Why don’t I post anymore? in estivation, inside asteroids, or seeded by intelligent life? Then what could it’s terraforming function be? Perhaps similar to what Charles Darwin was best known to explain in his lifetime; the function of earthworms in soil fertility on the land. Maybe Paleodictyon made or makes seafloors more hospitable to life by making mud there permeable & giving opportunity of anchorage to some marine animals & plants, like kelp. To find paleodictyon, or it’s beneficiaries, look at the anchors of marine animals & plants that anchor to seafloors. See if there are any that match Paleodictyon’s pattern. Maybe by freezing their stalk bases & mud under them with liquid nitrogen, all that could be brought to a lab intact, thinly sliced into cross sections & examined under magnification. Has that ever been done? Tardigrades may be another terraforming organism of ancient Earth. Their function may be to transfer genes between plants to maximize plant’s opportunities to benefit from genetic diversity; more genes they may use, if natural selection proves them useful. WIth all means to circulate genes by plant’s own direct reproductive processes plus gene transfer by viruses, tardigrades may furnish yet another way of spreading potentially useful genes from plant to plant.